European and American architecture style inspired by Classical Greek - and especially Roman - ruins. Georgian Four King Georges in England. George III ruled England when Neoclassicism was popular. Georgian Neoclassical Neoclassicism named after George III in England. Encompasses both Palladian and Adamesque Neoclassical styles. Palladian Neoclassical Earlier version of European Neoclassicism based on the books of Italian Renaissance architect Andrea Palladio who studied Roman ruins in Italy. Adam style/Adamesque Later version of European Neoclassicism based on Robert's Adam's studies of excavations at Herculaneum and Pompeii. Colonial Styles of architecture during America's colonial period, i.e., before the Revolutionary War. The most prominent style was Georgian because most the colonies were English owned. Federal The American term for Adamesque after the Revolutionary War. "Federal" is a a patriotic term. Roman Classicism/ / Jeffersonian Classicism / Classic(al) Revival Neoclassical version inspired by Renaissance-inspired Palladian Neoclassical style. Thomas Jefferson owned three copies of Palladio's books and used Palladian ideals in designing Monticello, etc. This vision of Neoclassicism competed with the simpler Federal style. Federal style architecture is the American version of British Adamesque style. In Britain, in the second half of the 18th Century, Roman architectural precedents, especially in the contemporary excavations of Pompeii, were popularized by Robert Adam. The style is referred to as Adamesque, or as "Georgian" in honor of the reigning monarch, George III. The English style came to America by way of British pattern books and an ever-swelling wave of masons, carpenters, and joiners who emigrated from England. After the Revolutionary War, in a display of patriotic zeal, the entire period in America, including Georgian architecture and furniture, became known as "Federal." The most common symbol used in the Federal style is the American eagle. Thomas Jefferson modeled his home, Monticello, and the University of Virginia on Roman precedents popularized by 16th century architect Andrea Palladio. Palladio's designs were also the model for Robert Adam's country villas (Harewood House). The urban designs by Adam, however, are influenced more by Roman urban excavations, e.g., in Herculaneum and Pompeii, and Adamesque urban designs are the major influence of American "Federal" style. Thus, a distinction is made between public buildings in Jeffersonian Classical Revival / Roman Classicism style and Federal urban dwellings. The best-known American architects known for their Federalist buildings are Charles Bulfinch, Samuel McIntyre, Alexander Parris, and William Thorton. Houses: The Adam house is most commonly a simple rectangular or square box, two or more rooms deep, with doors and windows arranged in strict symmetry. The box may be modified by projecting wings or attached dependencies. The stylistic focus is on the main entry -- a paneled door often framed by half or three-quarter length side lights and thin pilasters or columns. The door is often crowned by a fanlight, or entablature. Windows: Large windows with double-hung sashes, panes separated by thin wooden supports (muntins), Usually a number of small panes of glass because it was difficult to make large pieces of glass. There might be 12, 8, or 6 panes in both the top and bottom window sashes, e.g, 12-over-12 or 9-over-6. Windows aligned horizontally and vertically in symmetrical rows, usually five-ranked on front facade, less commonly three-ranked or seven-ranked; windows never in adjacent pairs, although three-part Palladian-style windows are common. Lintels and sills are rectangular or even slanted inward, and sometimes made of stone. Entrance: Elliptical or semicircular fanlight over front door (with or without flanking slender side lights). Interiors: Showcase hexagonal, oval and circular rooms (The most famous federal-style "oval room" is undoubtedly the Oval Office of the White House.) Decorations, including rosettes, urns, swags, oval paterae, bulls-eye corner blocks. Also known as the Adam Style, the Federal Style succeeded the colonial period following the signing of the Declaration of Independence. 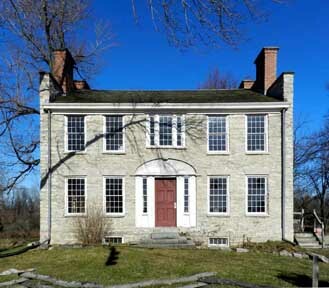 However, the Federal Style perpetuated many of the same ideas and techniques used during the colonial era including a preference for frame construction with clapboard sheathing common in examples found in the northern United States. Stucco and stone occur infrequently throughout the eastern United States. In general the symmetrical, box-like Georgian style of the late colonial period evolved into the more ornamented Federal Style, and is typically described as having a lightness and delicacy which was lacking in earlier Georgian designs. The most prominent feature of most Federal style buildings is an accented front entry door. Typically this feature is elaborated with an elliptical or semi-circular fanlight above the primary entry door, with or without sidelights, and is usually incorporated into a decorative surround which may feature moldings, pilasters or a crown. Buildings of this style also typically feature a cornice with decorative moldings, double- hung wood sash windows generally with six lights per sash with thin wood muntins, a five bay primary facade with symmetrical fenestration. Commonly, Federal style buildings appear as side-gabled, box-like structures. While some examples are relatively modest in their decoration, some Federal style buildings feature Palladian windows, oval rooms and decorative swags and garlands carved in wood or plaster. The Adam style in America "refined the proportions of the Georgian house and borrowed ornamental motifs like the urn, garland, and festoon from the recently excavated Roman country houses in Pompeii..."
The overall effect of Adam Style buildings, with their balance and symmetry, was much lighter. Details and decorations were both delicate and beautiful. The use of plaster for ceilings, ornaments such as cornices, and even fireplaces contributed to the light feel. Pastel colors and white were utilized. Wallpaper was often applied in lieu of wood paneling. Everything was scaled down in an attempt to eliminate any feeling of heaviness. "Ironwork becomes a major element in architectural design now that tasks call for balcony and stair railings so thin as to be impractical in wood." While there was not a typical Adam, or Federal, floor plan, rooms took on a variety of shapes, with oval and elliptical forms being typical. Staircases were moved from their normal positions and curved in ways that form symmetrical ellipses. The outsides of Adam Style buildings were also transformed. Often the shape was more horizontal. Hipped roofs were given very low pitches and are concealed behind balustrades. The scale of the buildings was much less massive; chimneys were not as bold. Doors may have been topped with semi-elliptical fanlights and flanked by sidelights. "A hallmark of the Federal Style was an increased emphasis on windows. This shift, partly due to growing availability of larger panes of glass after the Revolution, translated into exterior facades punctuated by windows." The windows were taller and the muntins dividing them were thinner, allowing as much light as possible into the houses. The houses could have been two to four stories high. High style houses of the period are composed of brick laid in the Flemish bond pattern. To continue the light and airy effect, exteriors were often coated with stucco. Frame houses of the period were usually made of overlapping clapboard. Houses ranged from the very elaborate central blocks with flanking wings to the basic rectangle. The simpler interpretations of these houses maintained the overall Adam Style but contained much less ornamentation. These characteristics of Adam Style architecture were included in the designs of the American architects of the period. Accompanying this new style in the United States were two important changes in the way American architecture was carried out. Architectural books, like Asher Benjamin's The American Builder's Companion, showed in precise detail how to carry out the style. Among the plates in that book is one for the "Plan and elevation for a Townhouse" in which several traits of the Adam Style are visible. In this plan, Benjamin includes the low hipped roof with balustrade, a curving staircase, and the taller windows all typical of the style. In another plan for two doorways, he draws the garland and semi-elliptical fanlight. And in a third plan, the exact proportions of the Adam Style window are drawn so that any architect can pattern his own design in the Adam Style. Charles B. Sears House, 75 Barker St.